Powers/Abilities: Able to fly, using rocket jets built into his feet. Armed with both a built-in laser and machine gun. History: It was the year 2003. When robotics expert Dr.Tenma lost his son Tobio in a car crash, he built himself a robot in the likeness of his dead boy. But the grieving father soon came to the realisation that though his construct might look like his son, it could never be a real boy. After a while the scientist sold the machine to a circus. Dubbed Tetsuwan Atom (Mighty Atom) by his new owner Hamegg, he was treated as a slave, and abused cruelly and needlessly. Atom was rescued from this life by Ochanomizu, another scientist, who convinced him to become an adventurer, battling threats to mankind. As time passed Ochanomizu built his new friend both a sister (Uran) and parents. The heroic robot also discovered Dr.Tenma had built a prototype before Atom, then stored this "big brother" in a warehouse at the Science Academy; when he was released, he was given the name Jetto. Jetto wasn't bad, but he wasn't too smart either, which often led him into trouble. Atom later discovered that he had another brother; a robot called Atlas had been built using his plans. However Atlas was rebuilt to be a far more powerful adult looking robot, and set off on a quest to punish humanity for the hurts it had inflicted on robots, bringing the brothers into conflict. Eventually Atom sacrificed his life to save Earth. Comments: Created by Osamu Tezuka. Tetsuwan Atom began as a successful comic strip in Japan in the 1950s. It was turned into anime and broadcast in Japan between 1963 and1966. 193 episodes were produced in total. Originally in black and white, a coloured version was released in 1986. A new series came out in 2003. There has also been a live action movie of the character. 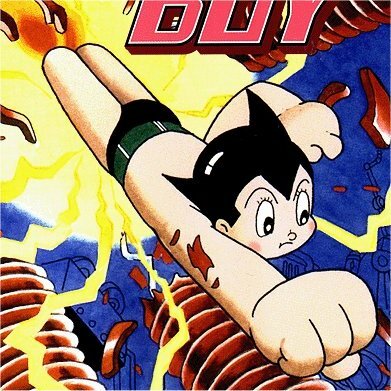 Astro Boy appears to be the inspiration for Frank Miller's Rusty the Boy Robot. Now Comics produced a comic about the character in 1987, reprinting the manga for the American market. The title lasted 20 issues.